Ebrahimi, R., Najafizadeh, A. (2004). Optimization of Hot Workability in Ti-IF Steel by Using the Processing Map. International Journal of Iron & Steel Society of Iran, 1(1), 1-7. R Ebrahimi; A Najafizadeh. "Optimization of Hot Workability in Ti-IF Steel by Using the Processing Map". 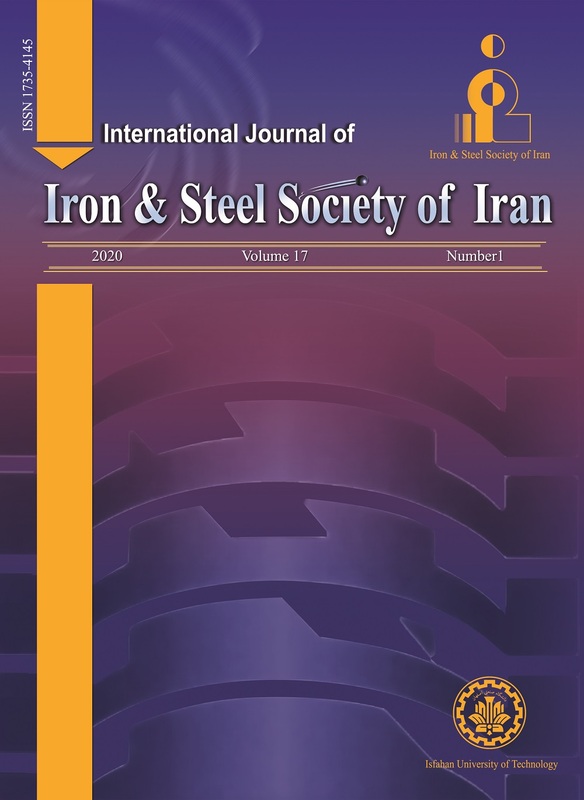 International Journal of Iron & Steel Society of Iran, 1, 1, 2004, 1-7. Ebrahimi, R., Najafizadeh, A. (2004). 'Optimization of Hot Workability in Ti-IF Steel by Using the Processing Map', International Journal of Iron & Steel Society of Iran, 1(1), pp. 1-7. Ebrahimi, R., Najafizadeh, A. Optimization of Hot Workability in Ti-IF Steel by Using the Processing Map. International Journal of Iron & Steel Society of Iran, 2004; 1(1): 1-7. Processing map for hot working of Ti-IF steel has been developed in the temperature range of 750 to 1100 °C and strain rate of 0.01 to 100 s-1. This map in the austenite region exhibits a single domain with a peak efficiency of 45% occurring at 1025 °C and strain rate of 0.02 s-1. The domain extends over the temperature range of 1000 to 1100 °C and strain rate range of 0.01 to 1 s-1. The true stress-strain curves and microstructural observations shows the occurrence of dynamic recrystallization in this domain. In two phase regions, where austenite and ferrite are present together, flow localization occurs in the form of bands with a fine grained structure as a result of dynamic recrystallization in the bands. These deformation bands are formed at 45° with respect to axial direction of compression. The processing map in ferrite region exhibits a domain with a peak efficiency of 38% occurring at 825 °C and strain rate of 0.02 s-1, so this domain extends over the temperature range of 800 to 850 °C and strain rate range of 0.01 to 0.5 s-1. The true stress-strain curves and microstructural results confirm the occurrence of partially dynamic recrystallization in this domain. T. Senuma, ISIJ Int., 41(2001), 520. A. Najafizadeh, J. J. Jonas, and S. Yue, Met. J. C. Malas, J. T. Morgan, K. A. Lark, and D. R.
Barker, Metall. Trans. A, 15(1984), 1883. H. L. Gegel, J. C. Malas, S. M. Doraivelu, and V.
 Y. V. R. K. Prasad and T. Seshacharyulu, Int. Wiley, New York, (1963), 93. J. Mater. Sci Lett., 17(1998), 1203. Mater. Sci. and Eng. A ,245(1998), 76. J. K. Chakravaritty, Y. V. R. K. Prasad, and M.
K. Asundi, Metall. Trans. A22 (1991), 829. O. Sivakesavam, I. S. Rao, and Y. V. R. K.
Prasad, Mater. Sci. Tech.,9(1993), 805. B. V. Radhakrishna Bhat, Y. R. Mahajan, and Y.
Venugopal, V. Maduraimuthu, M. Vasudevan, S. L.
Mannan, Y. V. R. K. Prasad, and R. C. Chaturvedi, J. Mater. Processing Tech., 132(2003), 262. Metals Park, Ohio, (1985), 113.
and B. P. Kashyap, Int. Mater. Rev., 45(2000),15.